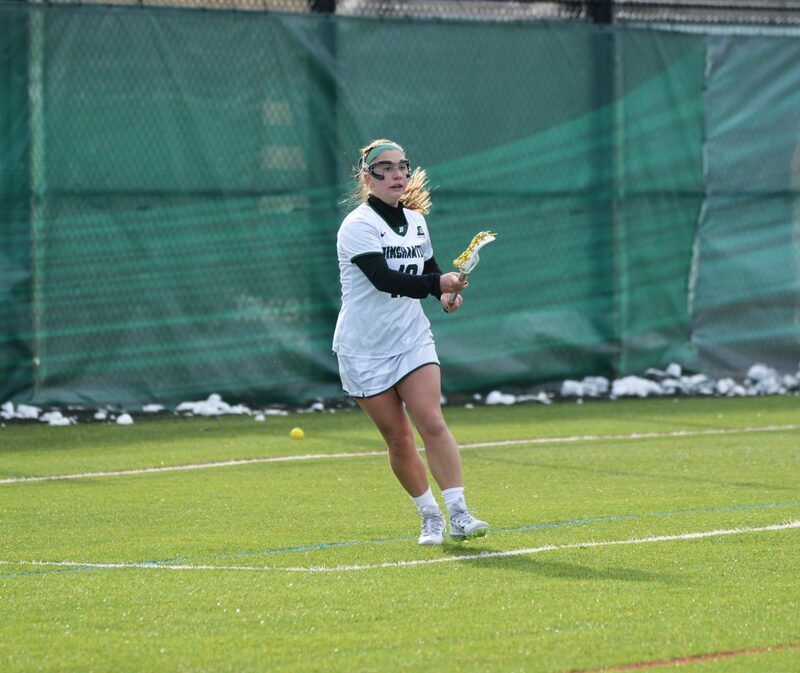 Sidney Slon/Pipe Dream Photographer Sophomore attack Paige Volkmann scored two goals and recorded an assist as Binghamton was blown out by Dartmouth. In a blowout defeat at home, the Binghamton women’s lacrosse team fell to Dartmouth 19-6 Sunday afternoon for its fourth loss in as many games. The Bearcats (0-4) remain winless in the 2019 season. BU struck first in the game, with senior midfielder Rebecca Golderman converting on a free position in the third minute. However, the Big Green (1-2) responded quickly as junior midfielder Sophia Turchetta netted her free position less than two minutes later, erasing Binghamton’s brief small lead. The visitors dominated the rest of the match in terms of possession and scoreline, but more importantly, they displayed a tenacious hustle in their quick attack and pursuit of stray balls in the air and on the field. The Big Green outshot the Bearcats 47-13 and were the first to most of the game’s ground balls, picking up 24 to Binghamton’s 14. BU continued to struggle on draw controls, winning eight to its opponent’s 19. The grueling minutes spent chasing on defense caused the squad to commit infractions that gave its opponent a number of free positions. Dartmouth had eight attempts, successfully converting on three. These unobstructed looks on net contributed to the overwhelming volume of shots on junior goaltender Taylor Passuello, who showed another strong performance under intense offensive pressure. Passuello has now set a career high in saves three times this season. While her play has certainly been noteworthy, the struggles of Binghamton’s defensive unit has contributed to a high volume of shots in several games. However, the team made defensive strides, and the intensity of their back-end press contributed to Dartmouth’s few errors. BU made 16 clears on 21 attempts. Dartmouth went a perfect 17-for-17 on clears, but the Bearcats forced their opponent to commit 13 turnovers, on par with BU’s 17. Dartmouth senior attack Kierra Sweeney was the story of the game. She scored seven goals, with five in the first half and two in the second. Sweeney put 12 shots on Binghamton’s goal, just one fewer than BU’s total shot tally, highlighting the gap between the teams’ attacking efficiencies. Desperately needed offense was in short supply for the Bearcats on this afternoon. Sophomore attack Paige Volkmann netted a goal in each half and recorded an assist. Volkmann’s first goal came off a pass from sophomore midfielder Kelly Quinn when the result of the game was still in the air. Quinn logged two assists as she continued her strong play to start the season. Goals from junior midfielders Amelia Biancardi and Alissa Franze kept the scoreline close in the initial stages of the game, but Dartmouth scored five unanswered in the last eight minutes of the half, forcing Binghamton to start the second period with a daunting 12-4 deficit. The Bearcats scored just two goals in the second half, with one coming from Volkmann and another from graduate student attack Emily Yoo. The Bearcats now have a four-day break to work on these aspects of their game and attempt to end their losing streak. After kicking the season off with a loss to Syracuse and two subsequent defeats in the final minutes of tight games, this most recent disappointment should mark an early wake-up call for the team. The team looks to get its first win of the year this Friday against Marist. The opening draw control is set for 4 p.m. at the Bearcats Sports Complex in Vestal, New York.